The hall is dedicated to the legendary Concorde. You can discover Concorde F-BTSD Sierra Delta, and the Concorde F-WTSS Prototype. The first flight of the latter was in 1969. 12 976: it is the number of hours flown by Concorde F-BTSD between 26th June 1978 and 14th June 2003, the date of its arrival to the Air and Space museum. The Concorde Sierra Delta holds the highest speed records for commercial flights. A crazy rumor announced the sale of one of the two Concorde located at the Air and Space Museum in le Bourget Paris, and its probable flight. This misinformation was quickly disclaimed by the MAE. Both planes belong to national heritage on the same level as the château de Versailles and are not for sale. 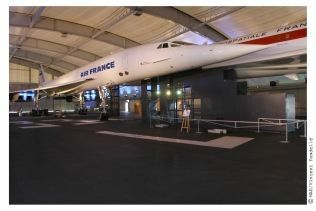 The Concordes in le Bourget will remain in the museum for the enjoyment of the visitors. For those nostalgic and disappointed not to see one of the two Concordes taking off: its last flight AF380Y from CDG airport to Paris Le Bourget on 14th June 2003 was immortalised. Access to the Concorde hall is free but a ticket is necessary in order to visit the interior of both supersonic planes. You can also be interested by our other english spoken heritage visits.